Sometimes, you just know what you like and don’t like. For example, I know that I’m not a lip gloss girl. It’s hard for me to find formulas that don’t drive me crazy, so I’m never quite compelled to try the latest glossy releases. I have a small handful of glosses in my collection that I’ve taken chances on, and have been let down by, and don’t have much of a desire to add to them. But sometimes, you can be wrong! I received the e.l.f. Essential EX-tra Lip Glosses in a package and wrote them off, I’ll admit it. I had these three shades just sitting in my closet… I thought the colors were pretty, but I just did not want to spend my time testing them only to be let down. But, something told me to hold on to them. So there they sat, just waiting to be paid attention to. 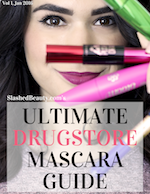 Finally, I was rummaging through my beauty inventory looking for a pretty pink, shiny lip product for a neutral look. I found the glosses again, and opened up the shade Marc. After one application, I knew I needed to open up the other two and actually give these a chance. The e.l.f. 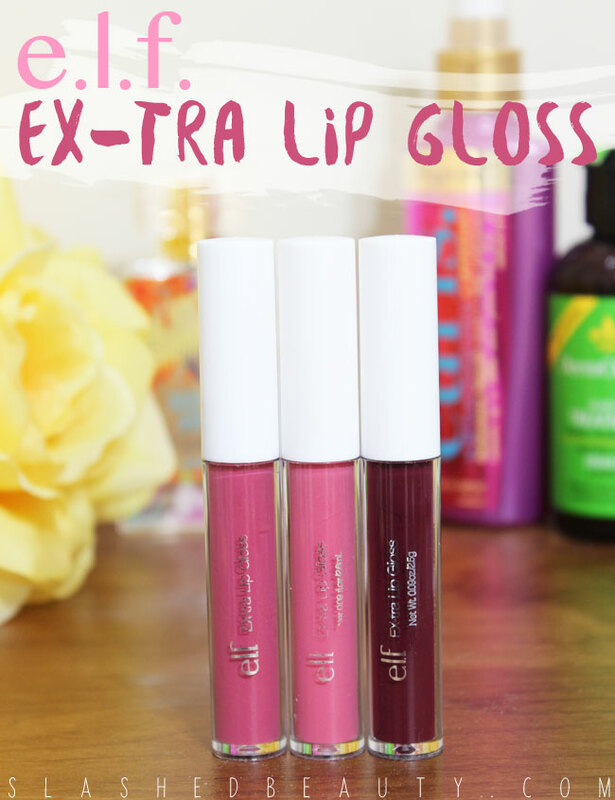 Essential EX-tra Lip Glosses are not your average glosses. Oh, no. You’ll find no stickiness or gloopiness here. Instead, your lips are met with a formula infused with Vitamins A & E, cocoa butter, sunflower, avocado, and grape that moisturize like no other gloss I’ve worn. The shades I have are Marc, Michael, and Luke. Marc is a dusty, neutral light pink with very fine shimmer in it. Michael is a rosy mauve with very fine shimmer in it. Luke is a vampy plum with no shimmer. First off, I was pleasantly surprised at the pigmentation of the glosses. While they have a slight translucency to them, they still apply with a lot of color on one swipe. Marc and Michael applied evenly, but Luke took a bit of fiddling– there were some spots where the color looked more opaque than others. I think this specific shade would look best over a liner. While I don’t typically favor shimmer in my lip products, the shimmer in Marc and Michael is so microscopic that it really only adds dimension and helps the shades catch the light. It’s not all that noticeable to me, which I like. The consistency isn’t too thick, but if you apply too much, they can slide around just like any other glossy product. 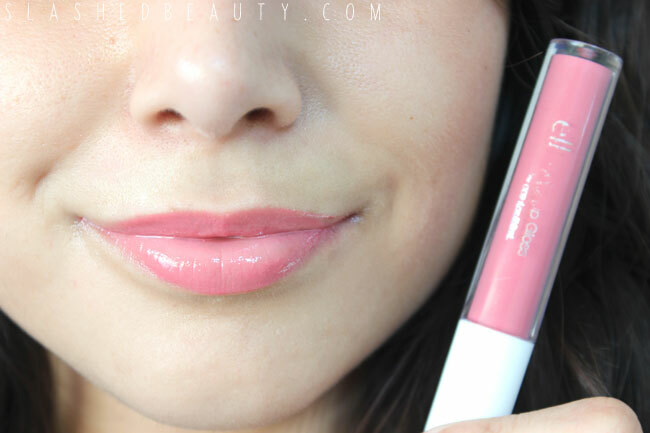 To help with that, the glosses have a flat, round brush that make them easy to spread over the lips in a smooth layer. I would still suggest starting with a light hand, then building up. With Michael and Luke, I found a slight stain left behind after the gloss faded away. 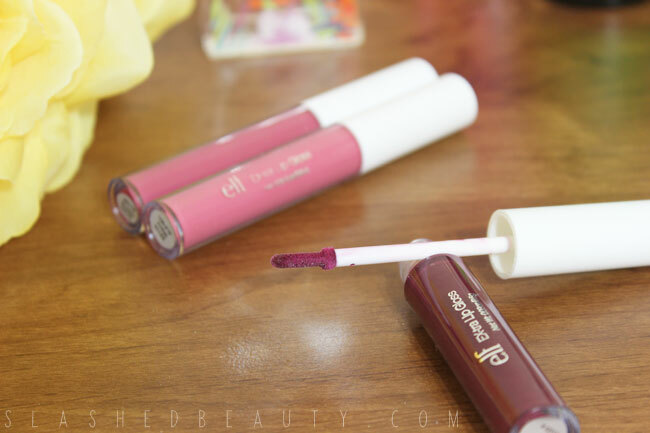 Not only are you left with a little color, but your lips feel so soft after wearing these. 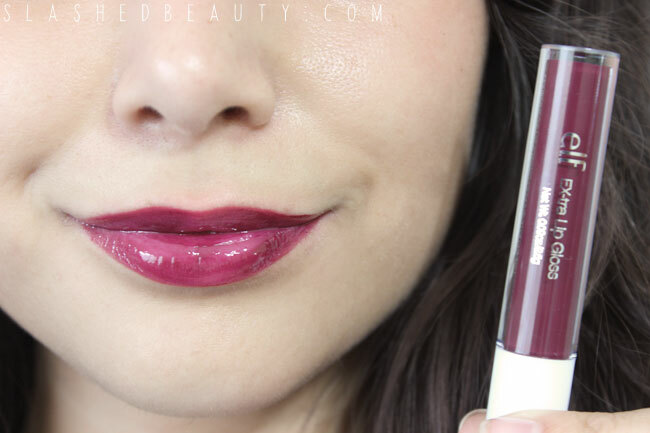 The formula is very balmy and comfortable to wear, which makes re-application come easily. Being a gloss, there is obviously some color transfer when sipping from a cup, and they definitely won’t last through a meal. But when left alone, the color stays in good shape for at least three hours. Overall, these glosses proved themselves worthy of my regular makeup rotation, as they’re EX-tra moisturizing, EX-tra colorful, and EX-tra comfortable to wear. Best part? In true e.l.f. Cosmetics fashion, they only cost a buck online. By the way, if you’re heading over to the e.l.f. site today (6/25/15), they’ve got a one day only 50% off the sale section deal going on right now! Just enter EXTRA50 at checkout on orders $20+. 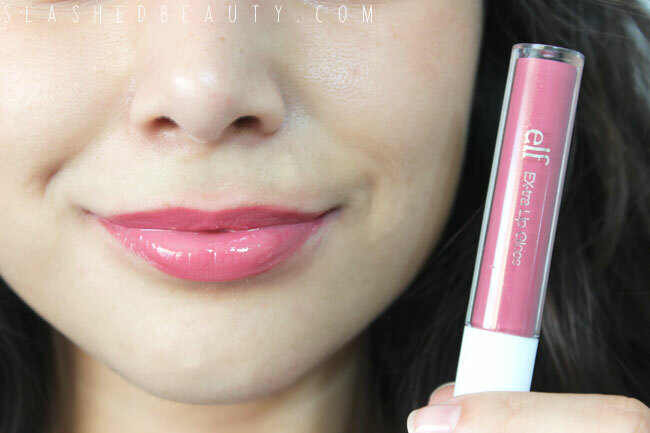 What do you look for in a gloss? These have some nice pigment on them, I likey. I like Luke the most! I actually look for glosses that leave a stain behind. I’m too busy to keep touching up my gloss. I’m much less likely to grab a gloss than a regular lipstick, so these sound pretty good to me. I like the pigmentation and that they’re not sticky. They all look really good on you, too. I may have to pick these up next time I place an order with ELF. These look really nice. 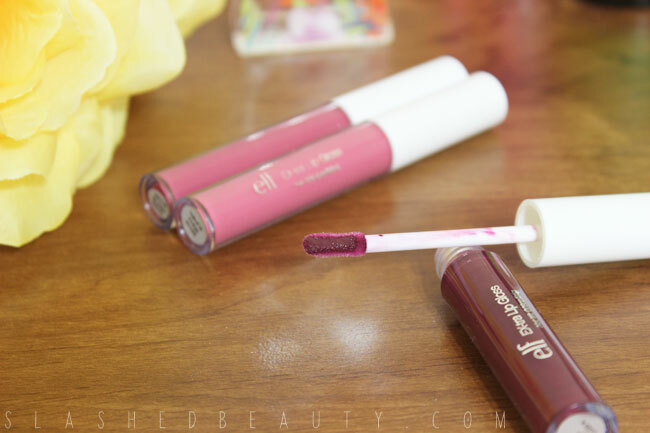 I reach for gloss more often than lipstick and am always looking for new, fab glosses to try and wear. These are really pretty, especially Marc and Michael. 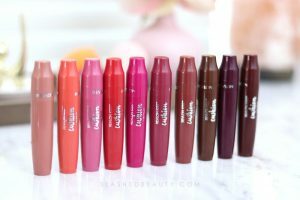 I’m not a lipgloss girl either, but these look and sound amazing! I’m also pretty impressed with that pigmentation. I totally agree with you on these – I bought all of them when they were new and was surprised at how good they were! Luke takes a bit of care to apply evenly, but I think it’s my favorite. Such a pretty color. It will definitely get a LOT of wear come fall!